"BERLIN, May 20 (Reuters) - Scores of firefighters battled a blaze at the home of the Berlin Philharmonic orchestra on Tuesday.Around 170 firefighters and more than 30 vehicles were at the scene trying to extinguish the fire which broke out during rehearsals open to the public, a fire brigade spokesman said.Television footage showed a pall of smoke billowing from the roof of the building, a controversial design by Hans Scharoun that was completed in 1963 and renowned for its acoustics.Musicians and visitors to the yellow Philharmonic building near the city centre had escaped and were no longer in danger, he said. There were no reports of injuries. "The fight is continuing," the spokesman said. "I can't yet say what caused it. We're in the process of opening the roof from above so we can get to the source of the blaze better. "The orchestra, which was founded more than 120 years ago, is regarded as one of the world's most prestigious. Britain's Simon Rattle is its principal conductor. 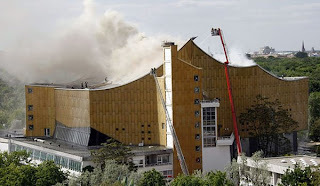 "We can rule out a total write-off of the Philharmonie," fire brigade spokesman Jens-Peter Wilke told n-tv television. "But the building is obviously in danger. We're doing all we can to rescue this important cultural site in Berlin. "The area surrounding the building has been cordoned off.A spokeswoman for the orchestra said a news conference about the fire would be held at 1430 GMT."